I'm sorry your list is too small. So this gal called me yesterday, she wanted to see if we were a fit for an interview series she was hosting. I was a little excited! No one ever asked to interview ME before and as a podcast junkie I freaking LOVE interviews. I am learning SO MUCH from listening to really savvy people have conversations with really savvy people. In fact as I write this Thriving Launch is playing in my headset. She complimented my brand + message and asked me to tell more about myself. Note to self.... if someone wants to interview or you want to interview them read their blog, stalk them on Instagram, Pinterest, Facebook, Persicope. Know who you want to interview don't waste your time or theirs "getting to know" them. Yea, we're not a match then because I have a minimum requirement of 3,000 people and most of the people I'm interviewing have 20,000-40,000 on their list." I'm damn proud of that list of 200! And if you have a list even smaller you should be proud too! These are REAL PEOPLE who have stepped up and said YES! I like what you have to offer, I want to be part of your tribe. No ones journey, experience or expertise is any more or less important because of the number on their list. and benefit others and should never-ever-ever suggest someone as "not being enough". My friend Megan Hale has made a whole business around helping women believe in their enoughness! Jenny Fenig taught me "acknowledge and validate". I find this happens often, other coaches insult the very people they are trying to impress. I think this whole situation could have played out favorably in one of two ways. #1. She could have stated in her email or phone message to me she had a min. requirement for participation (which is just total ICK factor to me, but I know someone is out there teaching it, and that's a whole 'nother post to write about) and respected her time and mine. #2. She could have used it as an opportunity to have a brief friendly conversation with me since we were both on the phone. I tried to engage with her about her marketing strategy with this (because I'm always coming from a place of genuinely wanting to help people) but she quickly clammed up and said she had someone helping her with that. I found it even more odd that she doesn't even have a WEBSITE!!! And then I realized she completely judged me by the size of my list. Once she knew that she had no desire to have a conversation with me. Do you have list shame? 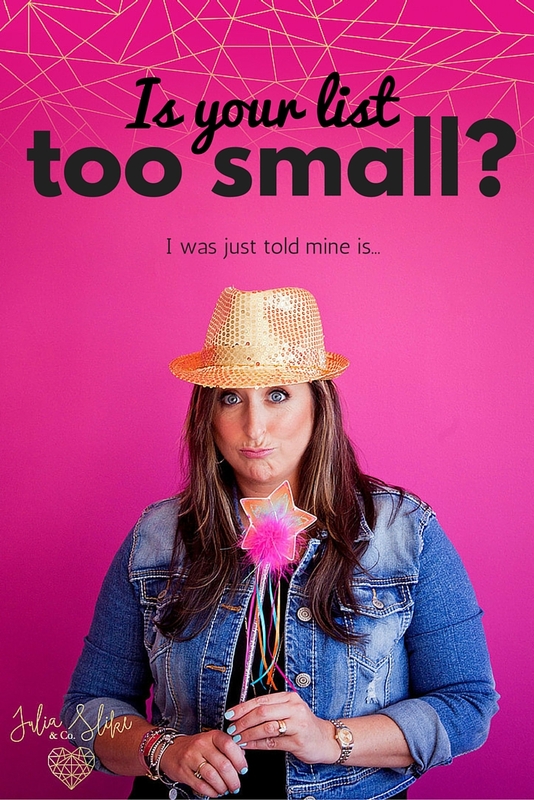 Has someone shamed you for the size of your list? If you want my 29 BEST tips to grow your tribe and list check out this!